Safe View doors and windows utilise the same outer frame as used in the Alu-gard products, but are fitted with either 304 grade stainless steel mesh or 7mm diamond grille. Safe View is a safety product only, and is used primarily where cost is a major consideration for the customer. The 304 grade stainless steel mesh is retained in the door or window frame with a riveted wedge retention system. 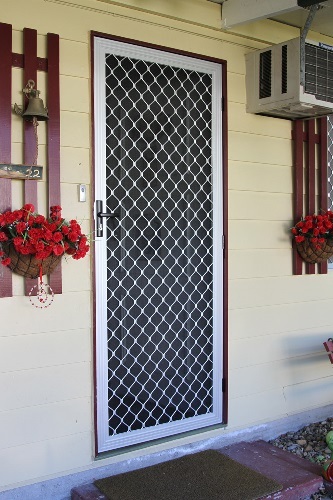 This provides a sturdy, attractive barrier door or window, with all the visual benefits of stainless steel mesh, for price-conscious customers. The retention system fixings for doors are covered with a special cover strip to provide a smooth and clean finished product, when viewed from both inside and out. The 7mm diamond grille is riveted into the built-in channel for extra strength, and is supplied already fitted with Ultramesh flyscreen as standard. Both options are classed as barrier doors/windows only, and are not security rated. They are ideal for occupied protection (while the resident is at home), where visibility is of high concern and complete security is not the primary purpose. Supplied as standard with the same high quality door lock as the security products, the option of adding a triple lock system is also available for increased protection. Windows can also be fitted with these screen options as required, for a matching look and function throughout the home.